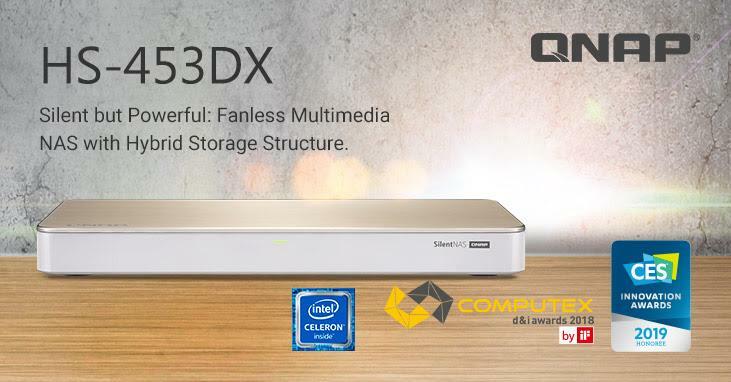 QNAP has launched the HS-453DX, a silent NAS that features an Intel Celeron quad-core processor, HDMI 2.0 output, 4K real-time transcoding and 10GbE high-speed connectivity. Powered by an Intel Celeron J4105 quad-core 1.5GHz processor with 4GB/8GB DDR4 memory and two 3.5-inch SATA 6Gb/s drive bays, the HS-453DX delivers up to 677 MB/s write/read speeds. With two M.2 2280 SATA SSD slots, the HS-453DX also provides a hybrid storage structure with SSD caching reinforcing traditional hard drives, helping to optimise the performance of demanding applications. "From TVs to game consoles to mobile devices, 4K enjoys full-spectrum support throughout modern digital homes,” said Jason Hsu, Product Manager of QNAP. The HS-453DX provides a wide range of multimedia applications including dual-channel 4K real-time transcoding, Plex Media Server, Cinema28 and OceanKTV.